The smell of chocolate chip cookies baking and wafting through the house is wonderful, indescribable. The first bite into these warm, fresh out of the oven cookies and I was in cookie heaven. A little bit crisp, a little bit chewy - the best of both worlds. I found the recipe on this lovely blog, Not Without Salt written by Ashley, she claims that this will be the last chocolate chip cookie recipe that you'll ever need. Did this cookie live up to its name? 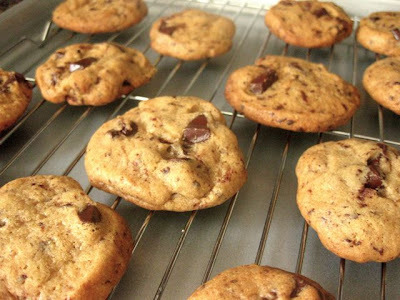 Yup, this is THE chocolate chip cookie for me and this recipe is definitely a keeper. I've heard that storing the cookie dough for 24 -72 hours before baking makes them taste better. I couldn't resist waiting so I baked up a batch immediately - these were good. 24 hours later - I baked up another batch. I think that letting it rest did give the cookie that extra something. 48 hours later - I baked up another batch. I couldn't really taste the difference between those baked 24 hours earlier. Would I wait 72hours to bake up the cookies? I probably couldn't resist. Each batch is gone almost as fast as I bake them. Oh and by the way, the little sprinkling of sea salt before baking gives the cookie an extra layer of complexity in the flavour. It's really up to you if you want to add it or not. Cream the butter and sugar till light and fluffy, about 5-7 minutes on medium high. Scrape down the side of the bowl. Continue mixing while adding the eggs one at time. Make sure each egg is incorporated before adding the next. Add the vanilla. Scrape down the side of the bowl. In another bowl, whisk to combine the flour, soda and salt. Fold in the chocolate with a spatula. Divide dough into quarters, roll to about 1 1/2 inch in diameter. Wrap and store for 24 hours before baking for best results. Cut about 1 1/4 cm thick to bake. Alternatively, scoop into 1inch balls, refrigerate for 24 hours before baking. You can freeze them after. I find scooping them right away, then storing, the cookie seems more chewy. If you choose, sprinkle a very fine dusting of good quality sea salt. Ashley from Not Without Salt suggests Fleur de Sel or Murray River Pink Salt. Bake at 360F for 12 minutes on the middle shelf. Cookies should be lightly golden on the outside but still look gooey on the inside. Let cookies cool on the tray for 2min before transferring to a cooling rack. 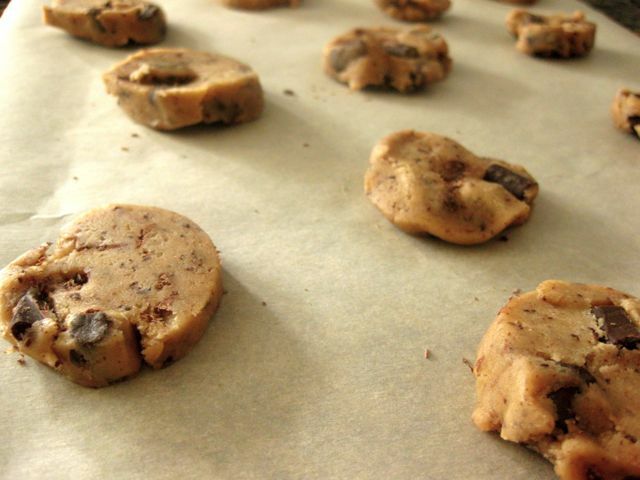 Cookie dough keeps well frozen, just defrost for an hour before baking.